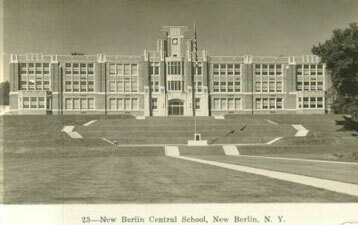 NEW BERLIN was formed from Norwich, April 3, 1807. Its name was changed to "Lancaster," May 9, 1821, and the original name restored March 22, 1822. A part of the town was annexed to Sherburne in 1853. It lies upon the east border of the County, north of the center. The surface is a rolling and hilly upland, the ridges extending north and south. Unadilla River forms the east boundary, and Great Brook, its principal tributary, flows south through the center. Matthewson Pond, situated near the center of the west border, is about one mile in length and three fourths of a mile in breadth, in its widest part, and about forty feet deep. The original outlet was changed many years ago by cutting a ditch through a stone embankment and making use of the water for propelling mills. The scenery in this vicinity is very fine, and being only about six miles from the County Seat, the citizens of Norwich as well as those of New Berlin resort thither for picnics and recreation during the hot season. Near the Matthewson Pond is an intermittent spring, which appears somewhat remarkable. It is said that a short time before a rain, however low the streams in the vicinity may be, this spring, situated in a hill, pours forth a rapid stream which continues until the storm rages, when it recedes to its usual dimensions. On the farm of Mr. Scribner, situated nearly opposite the Indian Fields of Otsego County, gun barrels have been plowed up, also stone tomahawks, arrow points, and human skeletons. It is the opinion of the old settlers that these fields were the theater of severe battles fought between different tribes of savages.The soil of the town is a shaly loam, sometimes intermixed with clay. New Berlin, (p. v.) situated upon the Unadilla River, in the north-east part of the town, was incorporated April 17, 1816, and contains four churches, an academy, a newspaper office, a paper mill, a tannery, a brewery, an iron foundry, several stores and mechanic shops and about 900 inhabitants. St. Andrew's Episcopal Church was organized by Rev. Daniel Nash, the first pastor, April 14th, 1814. The first house of worship was consecrated September 6th, 1816, by Bishop Hobart. The old church was torn down in 1847, and the next year a commodious stone edifice was erected in the Gothic style of architecture, and consecrated by Rev. Andrew Hull. The Presbyterian Church was organized in August, 1839, by Rev. Julius S. Pattengill, the first pastor. The Baptist Church was organized August 6th, 1831, with fifteen members, seven males and eight females. The first house of worship was, erected in 1840 and dedicated in October of the same year. The M. E. Church was organized about 1841, chiefly through the efforts of Rev. Francis D. Higgins. The New Berlin Academy was organized in February 1843, and was opened in the spring of 1844, under the principalship of Alonzo Phelps. The whole number of pupils during the first year was 133. Under the management of the present Principal, James M. Sprague, the school is in a prosperous condition. South New Berlin, (p. v.) situated on Unadilla River, eight miles below New Berlin, contains two churches, viz., Methodist and Baptist; four dry goods stores, two grocery and provision stores, one hat, cap, boot, shoe and fur store, several mechanic shops and about 250 inhabitants. The Baptist Church of this place was organized at White's Store, in Norwich, about 1804, with Elder Hosmer as pastor. 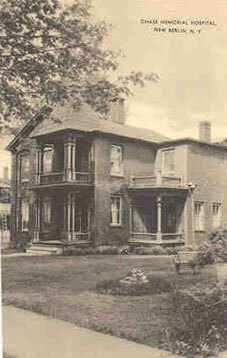 It was removed to this place in 1817, and was under the pastoral charge of Elder Windsor for nine years. The first church edifice was erected during his ministry. In 1826 Elder Chamberlain accepted a call from this Church and served as its pastor for twenty-three consecutive years. After an absence of fifteen years he accepted another call from this Church and is now serving them acceptably for the twenty-eight year. The present church edifice is a fine brick structure erected in 1857. Holmesville is situated in the southeast corner of the town, on Unadilla River, and contains a F. W. Baptist church, a sawmill, a gristmill, a tannery and about twenty-five houses. 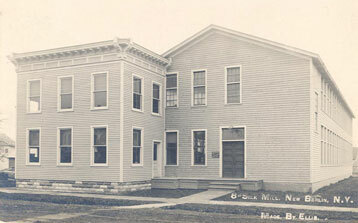 In the northeast corner of the town, about one and a half miles from New Berlin village, there is a cheese box factory and a turning and planing mill. 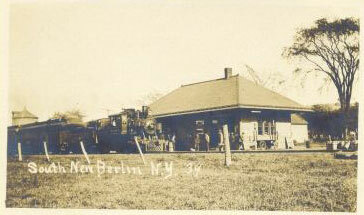 New Berlin Center is a post office on the Unadilla River, near the center of the east border of the town. Near this place is a gristmill, a cheese box factory and a turning and planing mill. The first settler in this town was Daniel Scribner, from Ballston, Saratoga County, in 1790. He intended at first to settle in Morris, Otsego County, but learning that there were Indian improvements on the Unadilla that could be purchased, he set out for that place, traveling through the woods until he arrived at a small clearing on the west bank of the Unadilla River, where he located. Here he found apple trees growing from seeds planted by the Indians. Having decided upon his location he returned to the head of Otsego Lake for his family, which by previous arrangement had been brought to that place. Taking them in a canoe, he proceeded down the Susquehanna and up the Unadilla to his future home. 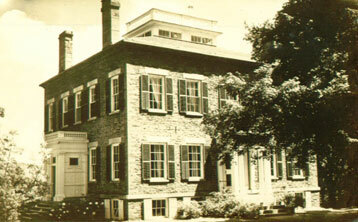 During the first year of his residence in this place he was obliged to go to Chenango Forks for grain for subsistence. This journey was performed in a canoe, down the Unadilla and Susquehanna to Binghamton, then up the. Chenango to the Forks. Having purchased his grain, he was compelled to return by the same route, extending his journey up the Susquehanna to Wattles Ferry, where was the nearest grist mill, thence down to the mouth of the Unadilla, and up that stream to the place from which he started. The whole trip occupied eighteen days and the distance traveled amounted to nearly two hundred miles. So great was the labor of going to mill, and so scarce was grain, that in the fall they were sometimes compelled to husk their driest corn and pound it in a stump, hollowed out for the purpose, a stone attached to a sapling bent over being used for a pestle. The finest meal made in this way was used for "Johnny Cake" and the coarsest for "Samp." These incidents serve to show a few of the difficulties and inconveniences with which the early settlers had to contend. Among the early settlers in this town were Nathaniel and Joseph Medbury, who located on Great Brook; Thomas Sarle, who located on the Unadilla, and Samuel Anderson, Jeremy Goodrich, Levi Blakeslee, Charles Knapp, Joseph Moss and Silas Burlingame, all of whom settled on the site of the village of New Berlin. Silas Burlingame was the progenitor of a somewhat remarkable class of men. His son, Daniel, was one of the pioneer Methodist preachers of the country, and though somewhat eccentric, is spoken of with veneration, and is regarded as a man of great piety and peculiarly impressive in his sermons and exhortations. He was the grandfather of Hon. Anson Burlingame, who will be noticed elsewhere. Richard Stoneman, grandfather of Major General Stoneman, of cavalry notoriety, was one of the early settlers of this town. Levi Blakeslee opened the first store in town, in 1800. For several years he purchased most of the grain sold by the farmers in this region, and floated it down the river to Baltimore, in arks built for the purpose. 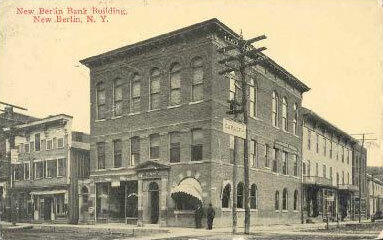 Daniel Scribner kept the first inn. The first blacksmith in town was Peleg Field, who removed to this place from Scituate, R. I., in 1796. In 1797 he set up a shop and for many years was the only man in the County who had a trip-hammer or who could fix mill irons. The first birth in the town was that of Louisa Bancroft, in 1797, and the first marriage that of Daniel Williams and Phila Parker, in 1794. The first school was taught by Josiah Burlingame. The first saw mill was built by Job Vail, in 1795 or 1796, and the first gristmill by Daniel Vail, on lot 74. The first framed building was erected by Jeremy Goodrich, in 1798, on East Street, New Berlin Village; the first tannery by Charles Knapp, in 1802. 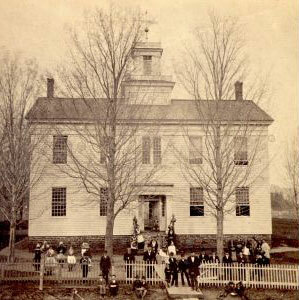 The first town meeting was held March 1, 1808, at which Barnabas Brown was elected Supervisor; Levi Biakeslee, Town Clerk; Matthew Calkins, Asa Williams and Thomas Brown, Jr., Assessors, and Gideon Wetmore, Collector. HON. HENRY BENNETT was for ten consecutive years a member of Congress from this town. He was born in Otsego County, September, 29, 1808; studied law and was admitted to the bar in 1832. During the Thirty-fourth Congress he was chairman of the Committee on Public Lands and reported a number of important bills for the benefit of the Western States, and during the Thirty-fifth Congress he served as a member of the same Committee. HON. ANSON BURLINGAME was born in New Berlin, November 14, 1822. His great-grandfather was Silas Burlingame, one of the first settlers of the town; his grandfather, Daniel Burlingame, was a distinguished pioneer preacher of the Methodist Church; his father, Joel Burlingame, was a man of strong mind great energy and of considerable acquirements. While Anson was quite young his father removed to the Western Reserve, in Ohio, and soon after to Michigan. His youth was spent on the Western frontier, at one time acting with surveying parties, at another participating in the making of Indian treaties far beyond the bounds of civilization. He laid the foundation of his classical education at the Branch University of Michigan, but removing to Massachusetts, he entered Harvard University, where he graduated in 1846. He also studied law at Harvard and engaged in the practice in Boston. In 1852, he was elected to the State Senate, and in 1853 was a member of the Convention for revising the Constitution of Massachusetts. In 1854, he was elected to the Thirty-fourth Congress, and was distinguished for his outspoken denunciation of Preston S. Brooks, for his cowardly assault upon Senator Sumner of Massachusetts. He was re-elected to the Thirty-fifth Congress, serving, as a member of the Committee on Foreign Affairs. He was also re-elected to the Thirty-sixth Congress, serving on the same Committee. In 1861 he was appointed by President Lincoln, Minister to Austria, and subsequently to China. In 1867 he resigned his position to accept the appointment of Ambassador from China to the United States, and also to the European Powers. In 1868 he visited the United States in the performance of his duty as Ambassador, and negotiated a Treaty with our Government, which is supposed to be advantageous to both nations. From the United States he went to England with his Chinese retinue, and subsequently to France. In 1865 New Berlin contained a population of 2,459, and an area of 27,947 acres. The number of school districts is 20; number of children of school age, 735; number attending school, 515; average attendance, 263, and the amount expended for school purposes the last year, $4,187.55.